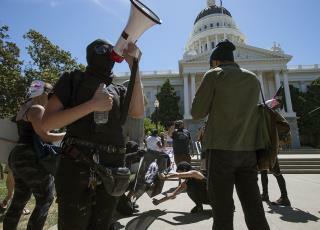 (Newser) – There were chaotic and bloody scenes outside California's Capitol building Sunday when a far-right group calling itself the Traditionalist Worker Party tried to hold a rally. Witnesses tell the Los Angeles Times that things turned violent as soon as a few dozen members of the white supremacist group turned up at the Sacramento rally, where they were met by hundreds of anti-Nazi demonstrators. At least nine people were hospitalized—seven of them with stab wounds—and many others suffered cuts, scrapes, and bruises. A Sacramento police spokesman tells the AP that the group had a permit to hold the rally and at least 100 police officers had been there to try to keep order.